The parent rock is the rock that exists before metamorphism starts. In most cases, this is sedimentary or igneous rock, but metamorphic rock that reaches the surface and is then reburied can also be considered a parent rock. On the other hand, if, for example, a mudstone is metamorphosed to slate and then buried deeper where it is metamorphosed to schist, the parent rock of the schist is mudstone, not slate. The critical feature of the parent rock is its mineral composition because it is the stability of minerals that counts when metamorphism takes place. In other words, when a rock is subjected to increased temperatures, certain minerals may become unstable and start to recrystallize into new minerals. The temperature that the rock is subjected to is a key variable in controlling the type of metamorphism that takes place. As we learned in the context of igneous rocks, mineral stability is a function of temperature, pressure, and the presence of fluids (especially water). All minerals are stable over a specific range of temperatures. For example, quartz is stable from environmental temperatures (whatever the weather can throw at it) all the way up to about 1800°C. If the pressure is higher, that upper limit will be higher. If there is water present, it will be lower. On the other hand, most clay minerals are only stable up to about 150° or 200°C; above that, they transform into micas. Most other common minerals have upper limits between 150°C and 1000°C. Some minerals will crystallize into different polymorphs (same composition, but different crystalline structure) depending on the temperature and pressure. Quartz is a good example as slightly different forms are stable between 0°C and 1800°C. 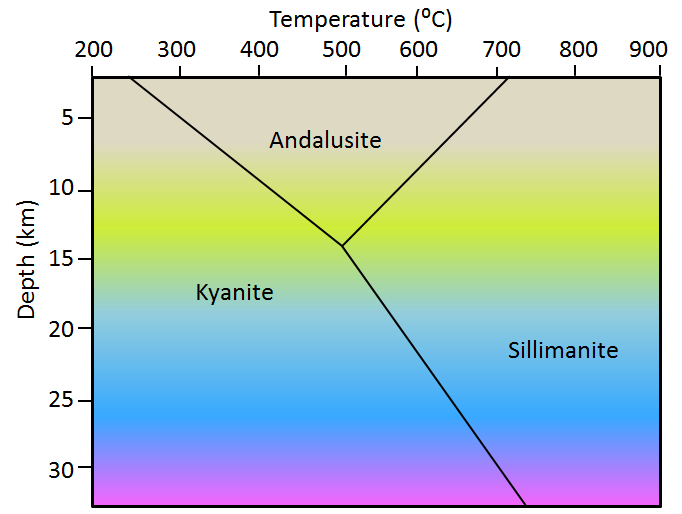 The minerals kyanite, andalusite, and sillimanite are polymorphs with the composition Al2SiO5. They are stable at different pressures and temperatures, and, as we will see later, they are important indicators of pressures and temperatures in metamorphic rocks (Figure 7.3). Pressure is important in metamorphic processes for two main reasons. First, it has implications for mineral stability (Figure 7.3). Second, it has implications for the texture of metamorphic rocks. Rocks that are subjected to very high confining pressures are typically denser than others because the mineral grains are squeezed together (Figure 7.4a), and because they may contain mineral polymorphs in which the atoms are more closely packed. Because of plate tectonics, pressures within the crust are typically not applied equally in all directions. In areas of plate convergence, the pressure in one direction (perpendicular to the direction of convergence) is typically greater than in the other directions (Figure 7.4b). In situations where different blocks of the crust are being pushed in different directions, the rocks will be subjected to sheer stress (Figure 7.4c). One of the results of directed pressure and sheer stress is that rocks become foliated — meaning that they’ll have a directional fabric. Foliation is described in more detail later in this chapter. Water is the main fluid present within rocks of the crust, and the only one that we’ll consider here. The presence of water is important for two main reasons. First, water facilitates the transfer of ions between minerals and within minerals, and therefore increases the rates at which metamorphic reactions take place. So, while the water doesn’t necessarily change the outcome of a metamorphic process, it speeds the process up so metamorphism might take place over a shorter time period, or metamorphic processes that might not otherwise have had time to be completed are completed. Secondly, water, especially hot water, can have elevated concentrations of dissolved substances, and therefore it is an important medium for moving certain elements around within the crust. So not only does water facilitate metamorphic reactions on a grain-to-grain basis, it also allows for the transportation of ions from one place to another. This is very important in hydrothermal processes, which are discussed toward the end of this chapter, and in the formation of mineral deposits. Most metamorphic reactions take place at very slow rates. For example, the growth of new minerals within a rock during metamorphism has been estimated to be about 1 mm per million years. For this reason, it is very difficult to study metamorphic processes in a lab. While the rate of metamorphism is slow, the tectonic processes that lead to metamorphism are also very slow, so in most cases, the chance for metamorphic reactions to be completed is high. For example, one important metamorphic setting is many kilometres deep within the roots of mountain ranges. A mountain range takes tens of millions of years to form, and tens of millions of years more to be eroded to the extent that we can see the rocks that were metamorphosed deep beneath it. Exercise 7.1 How Long Did It Take? This photo shows a sample of garnet-mica schist from the Greek island of Syros. The large reddish crystals are garnet, and the surrounding light coloured rock is dominated by muscovite mica. The Euro coin is 23 mm in diameter. Assume that the diameters of the garnets increased at a rate of 1 mm per million years. 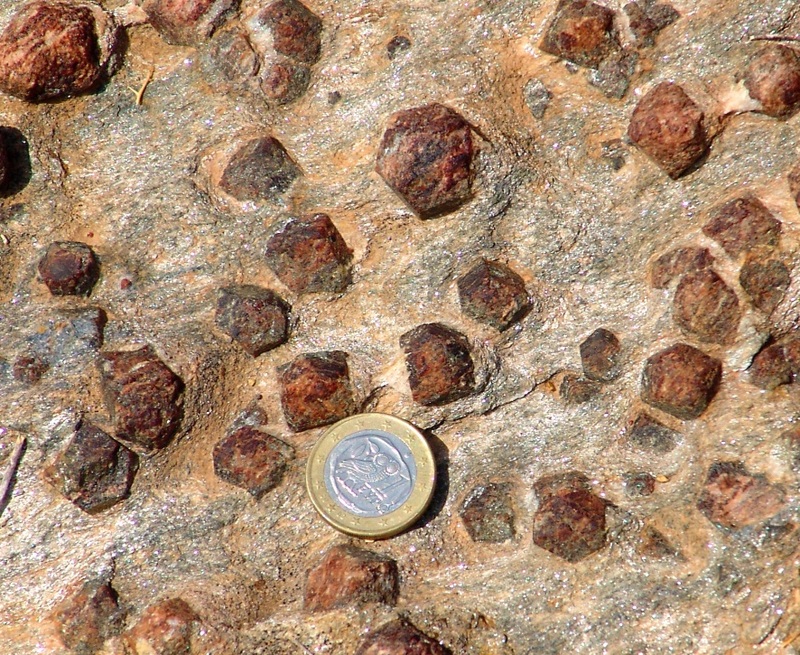 Based on the approximate average diameter of the garnets visible, estimate how long this metamorphic process might have taken. 7.1 Controls over Metamorphic Processes by Steven Earle is licensed under a Creative Commons Attribution 4.0 International License, except where otherwise noted.